cookies for nine years and counting. The Cookie People have been baking cookies for people throughout the triangle area since 2008. Owners Darrin and April Morey have always had a strong work ethic and desire to work for themselves. Using their culinary creativity and love of 'over the top' food experiences, they created their cookie business together. Our cookie magic is created by using the finest quality ingredients, including some from right here in North Carolina (for example, the honey in our Oatmeal Golden Raisin cookies is made by the local State Market company, Bee Blessed Honey). Our over-sized, soft and chewy, grandma-style cookies are nothing like store-bought. Our cookies start with dough we make locally from-scratch, minus additives and preservatives (cookies should not have a shelf life of six months!) and using only the highest quality ingredients. you've ever had and we believe it's the simple things in life like homemade cookies that make us truly happy. A classic cookie made with real butter, white and brown sugars, and tons of of high quality chocolate chips. We don't skimp on the chips! This is a German chocolate based cookie, with tons of caramely coconut and whole pecans. No need to travel to Germany for an authentic German Chocolate cookie! Especially for chocolate lovers. Real Ghirardelli chocolate, very little flour, Hershey's cocoa powder, and plenty of chocolate chips, making this cookie extremely rich. Crackly top and soft in the middle - chocolate heaven! A summer inspired cookie, made with lemonade concentrate, fresh lemon juice, and pure lemon extract. The flavor of lemonade is all throughout this soft pound cake-like cookie and it is delicious! Yummy lemon icing and yellow sparkly sprinkles decorate the top. This is one of our most unique cookies for people who like a little spicy heat. This cookie is flavored with chocolate cocoa powder and rolled in a mixture of cinnamon, chili powder and cayenne pepper - a delicious flavor combination. We dare you to try it! This recipe is from April's grandmother Alice, of Pinehurst, NC. A tried and true cookie that is hard to find these days. Made with brown sugar, molasses, and an incredible mix of spices including cinnamon, ginger and cloves. These cookies are chewy, dense and old-fashionably good. These cookies are like a bowl of oatmeal to go. We use old fashioned rolled oats for a more dense cookie, butter and brown sugar, Madagascar vanilla, a touch of kosher salt, and our special twist - locally produced honey and plump golden raisins. So many people requested this cookie we just had to bake it for you! Oatmeal chocolate chip is a dense chewy cookie filled with oats and our special twist: white AND dark chocolate chips. A sprinkle of sea salt on top before it is baked really makes your taste buds pop! Lots of peanut butter go in to these cookies, and of course they have the essential fork criss crosses on top. This is our awesome flavor created for all you peanut butter & chocolate lovers out there. You are going to love this! A chewy chocolate cookie stuffed with big chunks of peanut butter cups, swirled with more peanut butter and a whole peanut butter cup sunk right in the middle. Heaven! This rich, chewy cookie is one that customers demanded year after year. However, we didn't want to add it to the line up until it was perfect (and until bulk macadamias came down in price!). In every bite you will enjoy the contrast of crunchy, salty macadamia nuts and smooth, creamy white chocolate chips. Cookie paradise! The Cookie People love root beer so why not a root beer cookie? This is a soft, chewy cookie. Root beer extract is in the cookie and in the icing on the top. One bite and you will swear you are sipping on a creamy root beer float. You may remember these from when you were a kid - a crinkly topped sugar cookie rolled in cinnamon-sugar. Great with coffee or tea. A good old fashioned cookie, simple but heavenly. 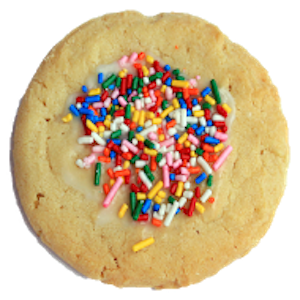 Choose plain sugar cookies or sugar cookies decorated with white icing and rainbow sprinkles. Great for kids of all ages. Want to suggest a flavor? us a message in the contact section. Small business is not for the faint of heart. It's for the brave, the patient and persistent. It's for the overcomer. Morgan Street Food Hall instead of the State Farmer’s Market.